Reading Time Wonders a.k.a Easy last Minute English Lessons! Free Downloads. Okay, so this is the mega pack of reading time lessons. At my school instead of after school classes I was asked to come in early and teach "story time" - which meant, a 30-45 minute lesson that had lots of reading in it. At first I struggled as the online books were too hard for ESL and not engaging enough to read to them alone - so I started making PowerPoint presentations that have reading within them but far more interesting. Some powerpoints include links to videos and some even link to online books that match the presentation. These lessons would be excellent for after school classes / English Club or anytime when you don't need to teach a specific topic but you can't play a movie, etc. Most take around 20-30 minutes depending on how the students participate and all the lessons could easily be paired with a worksheet or craft activity of your choosing. Story Time PowerPoints, click title to download. 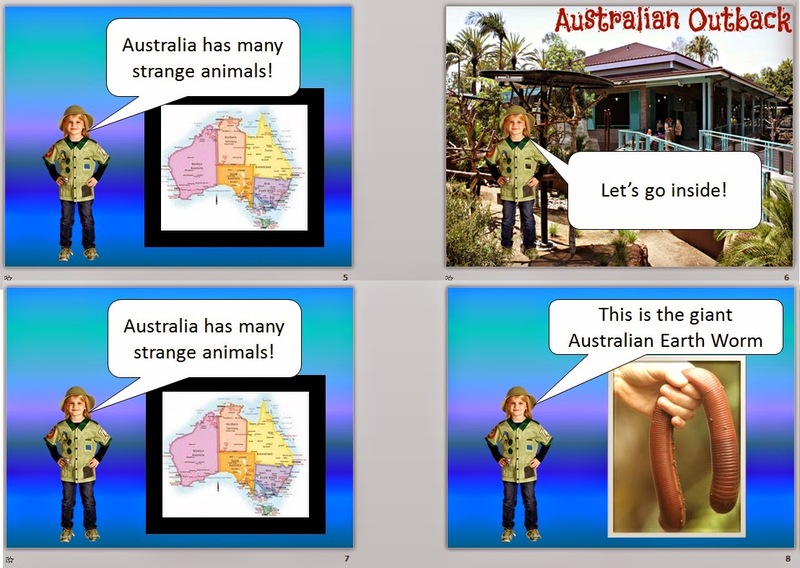 This PPT is all about strange animals. 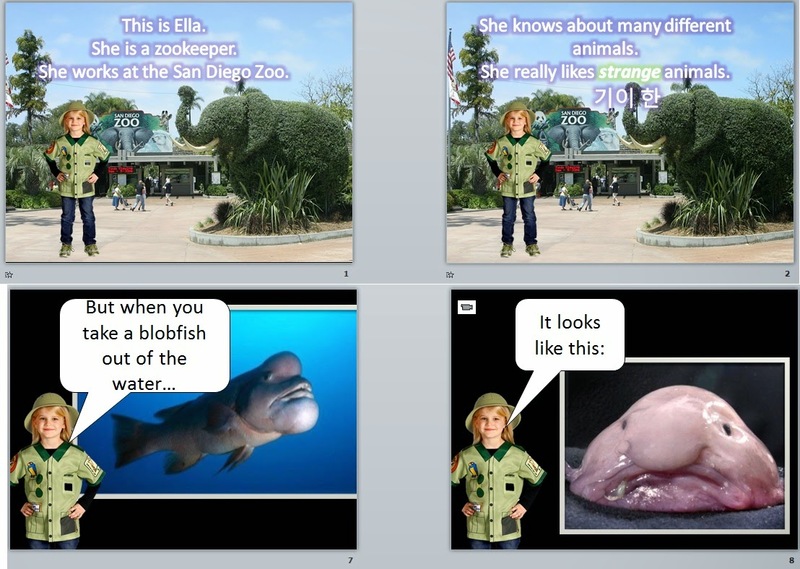 I have a little intro with 'Ella the zookeeper' and then it goes into basic slides with information on some strange animals. It includes the Blobfish, Narwhal and Dumbo Octopus.The slides with a video camera icon link to a Youtube video (which I stop and play at times I choose, you can play them full length also) - click picture for link. Kids really enjoyed it, liked the videos and asked lots of questions. Same set up but this time with animals from Australia in focus. You can add to this one, mine is a bit short as I had them colour a scorpion fish. This Powerpoint is long, you can skip parts that you don't need easily. The video is really interesting as it shows food kids eat for lunch around the world, including Korea! The kids found it really fun to watch. I also added a few more links to videos at the end if you have lots of time. Great to pair with a lesson/unit about food. This PowerPoint was really a hit with my grade 5 and 6. They loved looking at the strange inventions I showed them. On the second slide I have some key sentences I go over with them beforehand and then while presenting the products I ask the questions and use the phrases. Good basic speaking practice, you can make it more structured and more relaxed , up to you! Would be useful during the job unit of the textbook - talking about inventors/designers... for a higher level class I would get them to draw and think of their own inventions or an adult ESL class, I would ask them to choose one of the inventions within the presentation and then write an advertisement for it. This ppt is a very short and slightly inaccurate retelling of Toy Story 2's Woody and how his arm ripped. 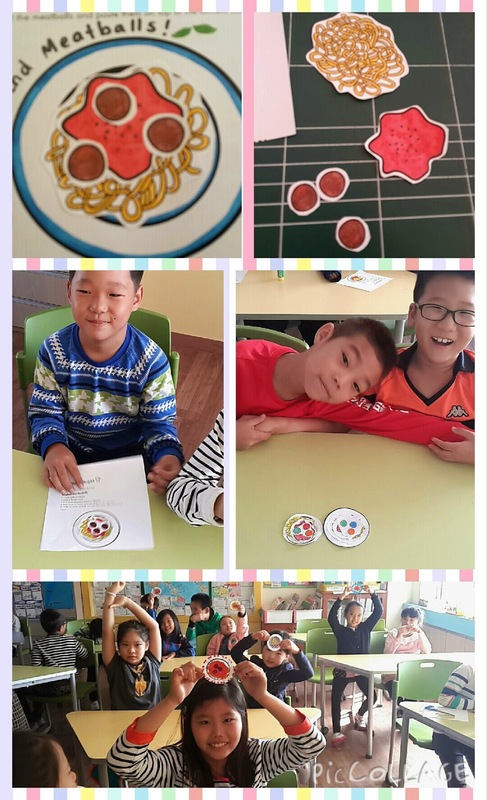 It is much more focused on reading with the class. I got them to read along with every slide. I also have a video in the middle where the old man fixes Woody's ripped arm and after the video they have to remember what the man did first, paint, sew, etc. So a short memory game embedded. I also have 2 videos at the end to extend the time. Good reading lesson that you can shorten or lengthen easily. For the young ones they can colour in Woody or design their own doll, make dolls - lots of craft ideas out there. This is a short powerpoint focused on reading the story of Humpty Dumpty. I found and played a song version of the story online (there are heaps on Youtube) and then we went through the basic vocab using the ppt and then went to a online reading site that went over the story as well. Very basic ESL reading, kids found it enjoyable. 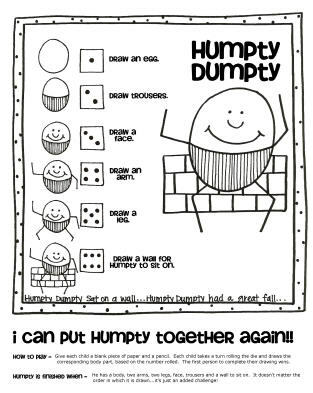 I also like this drawing dice game that you can play to get the kids to 'put humpty back together again'. This is another short and sweet reading powerpoint. It's got Korean translation to the vocab and then links to a reading online website as well as the Youtube song in the beginning. You can extend the lesson easily, with a craft or colouring page, etc. Good for the young ones especially. The lesson was a hit but you can use only the reading PPT as well. It just goes over a very basic story of the Disney movie's Alladin and includes links to short videos. 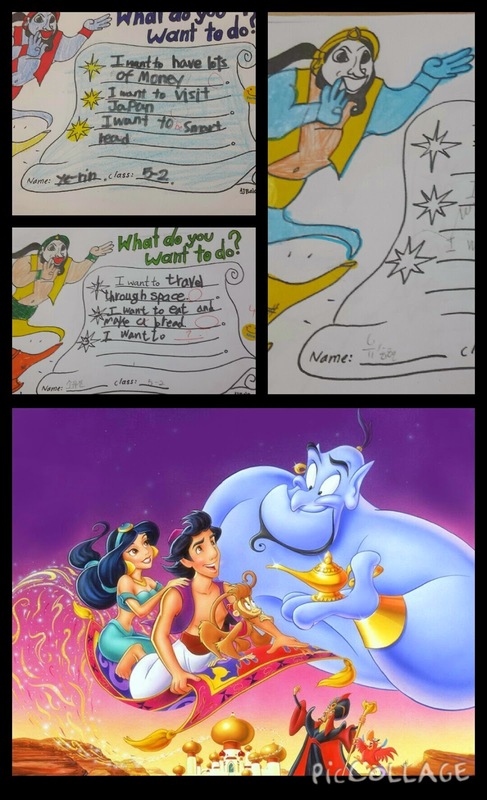 See how I taught and did the lesson and download the genie worksheet here. Another reading powerpoint which I have used in class. It was a blast with my grade 1 and 2 as I also got these cool worksheets where you colour the spaghetti and then cut and stick. Also included on the slide show is a bit about pizza that goes with a song. You can see that lesson and download the ppt and worksheets here.